khazen.org, Malek Fady el Khazen. Thanks to our President Michel Suleiman, who is leading Lebanon to defend its interest and constitution the new Government was created under his leadership . 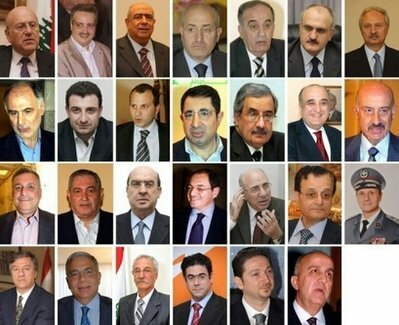 We hope for the new ministers to serve Lebanese daily problems, from insurance, health care, internet connection, retirement, electricity, transportation and many more issues and concentrate less on foreign relation. khazen.org understands that it is not possible to ignore our foreign policy because of our geopolitical situation but stresses it is as important to concentrate and focus in Lebanese domestic policies. We hope that the government concentrate on local government efficiency and problems, having an effective financial plan, city development, investment, growth and privatization. Most importantly khazen.org stand by the presidency under the leadership of President Michel Suleiman who has been leading us for a prosperous Lebanon. We also praise the close relationship and alliance btw the President and the Maronite Patriarch who is our father. A golden alliance between an improvement of local policies to better serve the Lebanese interest under the morality umbrella lead by our Patriarch. We also thank our Maronite Patriarch Mar. Bechara Raai leadership in bringing all of the communities together and reminding the politicians about the day to day misery and difficulties of Lebanese citizen. Lebanon's new government convened at the Presidential Palace for its first meeting, in which a committee of ministers tasked with drafting the new Cabinet's policy statement was formed. The Lebanese president also expressed hope that the ministerial statement be based on national fundamental principles, the national Constitution and the Taif Accord, which ended Lebanon's bloody 1975-1990 Civil War. ""The Lebanon government was 100 percent Lebanese without any foreign intervention (in the Cabinet formation process)," Suleiman said after the first meeting of Prime Minister Najib Mikati's government." Suleiman also urged cabinet ministers to "promptly start work." 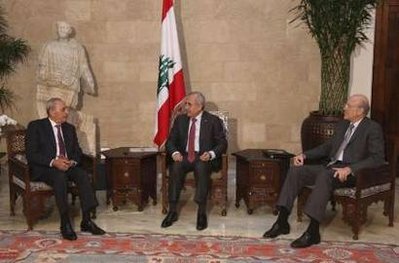 For his part, Mikati called on ministers to join forces in order to meet the internal and external political challenges lying ahead. The new Lebanese Cabinet's policy statement will outline the government's position on issues such as Hezbollah's arsenal and the UN-backed Special Tribunal for Lebanon, which is investigating the 2005 assassination of Lebanese Sunni Former Prime Minister Rafik Hariri. Lebanon's new Prime Minister Najib Mikati said Friday the country will not confront the international community, and vowed to maintain ties with all the friendly countries. "We are part of the international community and we want the best relations with friendly and neighboring countries," Mikati told a delegation of businessmen in Beirut, adding that there were international opportunities that Lebanon should benefit from. The prime minister also pledged to maintain national unity, saying it was a "red line." Mikati said his cabinet will strive to meet the aspirations of the Lebanese people. "Lebanon's safety and stability and unity of the Lebanese are red lines that no one is allowed to cross," Mikati added. Mikati also vowed to tackle Lebanon's ever-deteriorating economic situation, and briefed the businessmen about his platform to salvage the country's economy. There are fundamental challenges facing Lebanon in the international community and the new Cabinet will not allow anything to harm the country’s national unity, Prime Minister Najib Mikati said. "We are part of the international community and we want the best relations with friendly and neighboring countries. There are fundamental challenges that we will face and be attentive regarding their dangers and repercussions,” Mikati said following his meeting Global Group of Businessmen Friday, adding that there were international opportunities that Lebanon will benefit from. Daily star: BEIRUT: Najib Mikati began his tenure as Lebanon’s prime minister at the Grand Serail Thursday with a promise to give priority to tackling the people’s socio-economic woes, stressing that his Cabinet members would work as one team to serve all Lebanese. Mikati arrived at the Grand Serail at 9:30 a.m. for the first time as prime minister since 2005. Received by Cabinet Secretary General Suhail Bouji and Serail staff, he reviewed an honor guard before heading to the prime minister’s office. Mikati served as prime minister for three months in 2005 following the assassination of former Prime Minister Rafik Hariri, whose killing threw the country into political turmoil and led to the collapse of the government of then-Prime Minister Omar Karami. Mikati’s technocrat Cabinet oversaw parliamentary polls which resulted in a sweeping victory for the Future Movement led by Saad Hariri, son of the slain leader. In an interview with LBCI television Thursday night, Mikati denied March 14 parties’ charges that Syria had exerted pressure to hasten the formation of his Cabinet. He said there had been no interference by any party in the Cabinet’s formation. “Why was the Cabinet’s formation tied to any external matter? This [Cabinet’s formation] was a purely Lebanese issue and [the Cabinet] was made in Lebanon,” Mikati said. He added that Syrian President Bashar Assad’s phone call to congratulate President Michel Sleiman shortly after the Cabinet lineup was announced was normal between the presidents of neighboring countries. “Where are the Syrian or non-Syrian touches in the formation?” he asked. Mikati swore to God that he did not receive any contact from Syrian officials on the eve of Cabinet’s formation. “I formed the Cabinet by myself at 11 p.m. Sunday and I only told the closest people about it. I went to the president [Monday] telling him that I will not leave the [Presidential] Palace unless the Cabinet is formed,” he said. Addressing the Cabinet’s first session Wednesday, President Michel Sleiman said the new Cabinet was “100 percent Lebanese,” indirectly rejecting March 14 claims that the government had been formed under Syrian pressure. In the interview with LBCI, Mikati also scoffed at the March 14 parties’ accusations that his Cabinet was dominated by Syria and Hezbollah. “I leave it to the Lebanese people to judge whether this government is a Syrian or Iranian [dominated] government. Is this a government of Hezbollah which has two ministers, and it and its allies have 18 ministers [out of 30]?” Mikati asked. “This government has independent and centrist ministers … This government will only succumb to the Lebanese people. It is in Lebanon’s interests to be on good relations with all brotherly and friendly states and to respect U.N. resolutions.”Asked what his government would do if the U.N.-backed Special Tribunal for Lebanon’s indictment implicated Hezbollah members in Hariri’s assassination, Mikati said the Cabinet would meet to take an appropriate decision. He reiterated his government’s commitment to civil peace and international obligations. Mikati said that in the first Cabinet meeting after winning Parliament’s vote of confidence, he would demand the renewal of Central Bank Governor Riad Salameh’s mandate, which expires at the end of July. Both the March 8 and March 14 camps support a new six-year term for Salameh. Earlier Thursday, Mikati chaired a meeting of a ministerial committee tasked with drafting a policy statement on the basis of which the government would seek Parliament’s vote of confidence. Headed by Mikati, the committee which includes 12 ministers, was set up during the Cabinet’s first meeting Wednesday. During a meeting with the Serail staff, Mikati reiterated that the new Cabinet’s priority is to address people’s needs, stressing that Cabinet members would work hand-in-hand. “Our priority is to tackle the people’s urgent needs and affairs. We will work as one task team to serve all the Lebanese. We will work in this spirit with no malicious or vengeful acts,” Mikati said. He added that the government would work to translate its motto, “all for the country, all for work,” into deeds. “There are big objectives and many challenges. We have to do our duty in order for the Lebanese to feel that the state exists. This matter constituted the biggest incentive for us to complete the government’s formation,” Mikati said. The Cabinet’s formation has ended a political stalemate that has thrown the country into a power vacuum for five months. During the meeting of the committee charged with drafting the policy statement, the ministers drew up the outlines of the document. In addition to addressing major social and economic issues that concern the public, the policy statement is expected to outline the government’s position on thorny issues such as Hezbollah’s arms and the STL, which is investigating the Hariri assassination. A ministerial source said he expected the committee to finish the outlines of the policy statement soon. The committee has begun discussing social and economic issues and postponed until next week thorny and divisive issues, such as Hezbollah’s arms and the STL, the source said. Hezbollah’s Minister of State for Administrative Reform Mohammad Fneish, a committee member, said the policy statement will address U.N. resolutions. The committee will hold another meeting Tuesday. Sources close to Sleiman expected that a draft policy statement would be finalized “within a maximum of one week,” adding that it would stipulate that Lebanon’s army, people and resistance have the right to liberate Lebanese territories occupied by Israel and uphold Lebanon’s commitments to U.N. resolutions, especially 1701, which ended Israel’s 2006 war against Lebanon, and to the country’s protocol of cooperation with the STL. Sleiman had said the Cabinet’s policy statement should be based on national principles, the Constitution and the Taif Accord, which ended Lebanon’s Civil War. Meanwhile, Lebanese Forces leader Samir Geagea kept up his blistering campaign against the government, saying Mikati’s Cabinet would isolate Lebanon from the international community. “When governments were formed in Lebanon, statements of support, blessing, satisfaction and desire to help were issued immediately by the Arab and international communities. Except this time, the formation of a new government was met with complete Arab silence along with some skepticism, with the exception of Syria and Iran, which have emerged as the biggest winners from this formation. This is in addition to complete Western skepticism along with some strongly worded warnings,” he told supporters at his residence in Maarab. He cast doubt on what the new government could achieve, when it has been disavowed since its birth by more than half of the Lebanese people and the majority of Arab and foreign states did not show readiness to cooperate with it. “Therefore, it is correct to call this government a government to isolate Lebanon from its Arab environment and from the international community,” Geagea said. BEIRUT, June 13 (Xinhua) -- Lebanon's new Prime Minister Najib Mikati announced Monday a 30-member government line-up nearly five months after he was designated for the post. The announcement of the new Lebanese cabinet witnessed a precedent with the Shiite community relinquishing one of the six cabinet seats allotted to it by the constitution for a Sunni. According to Lebanon's power-sharing system which is mainly based on sectarian grounds, government and parliament seats are equally shared between religions and sects. 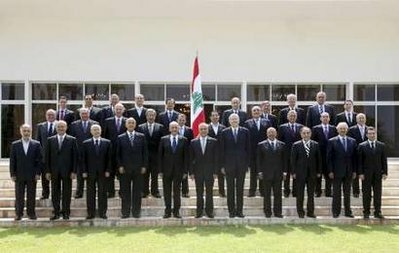 The announcement was also preceded by a summit at the presidential palace between Mikati, President Michel Suleiman and Parliament Speaker Nabih Berri, when the latter informed the president and prime minister of the Shiite community's decision to abandon one seat from its governmental share so as to facilitate the birth of the new cabinet. The government formation process faced numerous snags concerning government shares mainly the Sunni and Christian shares. But despite giving up one minister from their share, the March 8 alliance headed by Shiite armed group Hezbollah was allotted the biggest share of government seats, which amounted to 17. The centrist bloc, which Mikati represents was allotted seven portfolios, while the share of President Michel Suleiman consisted of two portfolios and the Druze Progressive Socialist Party counts three representatives in the new government. The key Interior Ministry portfolio, which was vied by both the President and Hezbollah's ally Free Patriotic Movement leader Michel Aoun, was allotted to a consensus figure. In a sign that regional and international conditions have become ripe for the Lebanese government to see the light, Syria's President Bashar al-Assad phone Suleiman and Berri to congratulate them on the new cabinet. Also, UN Special Coordinator Michael Williams said the announcement of the new government was "a very important development for Lebanon." "A new government will enable the country to address the manifold challenges facing the country, whether economic, political or security," he told reporters following talks with the new prime minister. Speaking to reporters following the announcement of the new cabinet, Mikati said the slogan of his government will be "all for the nation, all for work." The new prime minister also vowed to preserve coexistence in Lebanon and work to build the state and safeguard the constitution. "This government will be a government for all Lebanon and will work for all the Lebanese people without prejudice," he said. However, Mikati's high hopes received a blow after the head of the Lebanese Democratic Party Talal Arslan, who is a member of the Hezbollah-led March 8 alliance announced his resignation from the government hours after it was formed. Arslan who was appointed Minister of State in the new government said he was not pleased with the share he was allotted. The Druze lawmaker blasted the new Lebanese prime minister, saying he doubted that Mikati will succeed in his new mission as head of Lebanon's new government. Meanwhile, the new cabinet will hold its first session Wednesday, according to Mikati, after a commemorative picture of the members of the government. A committee of ministers will now be tasked to draft a policy statement for the new cabinet to approve and later on present to Parliament for a vote of confidence.